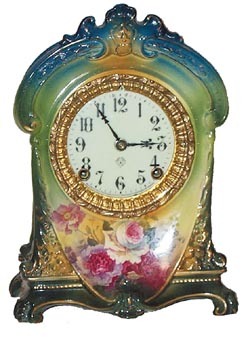 Ansonia Clock Co. Royal Bonn, "LaCruz", Ca 1901. This is a very colorful porcelain case with Ansonias New Art Tints, of dark blue at the top, changing to light greens and yellows in the middle, then to dark green on the base. Every Ansonia case is different and hard to describe. I will let the picture speak for most, but the feet have a paw look, and there is a head of a God or something in the bottom-center. The case is 11-1/2 inches high, 8-1/2 incheswide. American sash, beveled glass, one piece porcelain dial, all perfect.Case is signed on the back, dial signed in front. 8 day, half hourgong strike. Ly-Ansonia No. 2685 and No. 2691.